Steve writes, "I have recently purchased a Sony HDR-SR8E with USB2 input/output. I have just purchased Pinnacle Studio v11 Plus (Ultimate). I cannot get Pinnacle to see the camcorder as a capture device, nor will it import the m2ts files generated by the camcorder. Any advice on how to resolve this so that I can maintain the 1080i (AVCHD) output would be appreciated." It seems that some of the AVCHD files are more compatible than others with various video editing applications. After struggling with this new format for months, most of the kinks are worked out, but there are still steps you can take to get better results. One method I've found to be almost fool-proof is to take the Sony software that ships with these camcorders out of the mix completely. The new hard disk based camcorders don't need fancy software in order to work with the files on the disk. You can simply mount the video camera as a hard drive using a USB cable. 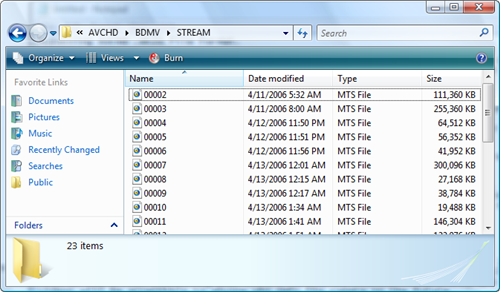 Browse to the camera in Windows Explorer under My Computer and find the files with .MTS extension on the camera. After locating the correct directory, copy the .MTS files to your hard drive. Then go back to Pinnacle Studio (or any other video editing app that supports AVCHD) and import the .MTS files. One additional step may be required for everything to work smoothly - depending on what mode you used for recording audio in your video, you may have multichannel surround sound audio in your file, which doesn't work well with some applications. To get around this, install freeware app AC3Filter, which down-mixes the multichannel audio to stereo.